All you need to know about Australia’s oldest and dirtiest coal fired power station closing this week. This week, the Hazelwood power station burnt coal for the last time. It’s a win for our climate and the health of the people of the Latrobe Valley. But also highlights a ridiculous lack of planning and care for regional coal communities by our Federal government, who refuse to develop a national coal closure plan. I'm from Gippsland, so the Latrobe Valley is pretty close to home. Over the past couple of years I’ve had the privilege of getting to hang out with some incredible members of the community who are looking towards a future beyond coal. There’s a lot of hype in the media around the power station closing, so let me give you the lowdown on why the closure of Hazelwood is a big deal for our climate and the community of the Latrobe Valley. Hazelwood is unsafe to work at. Engie, the majority owners of Hazelwood said it would probably cost them $400 million to get it up to appropriate Worksafe standards. The fact that it’s been operating 12 years past its use by date, and in such need of repair, is a testament to the workers running the station. The community of the Latrobe Valley have been powering the state of Victoria for over 50 years. You can turn your light on, scroll your news feed and drink your flat white because the people of the Latrobe Valley have dug up and burnt brown coal to create your electricity. I don’t know about you but I think that’s pretty incredible. Coal is dead. Producing energy through the burning of brown coal is pretty rough on the climate. Hazelwood is the most polluting coal fired power station in the country and closing it is going to reduce Victoria’s carbon emissions by 16,000,000 tonnes. Thats some sweet emissions reductions right there. Air pollution from the operation of Hazelwood has been estimated to kill at least 18 people in Gippsland each year, and make many more people sick. Once Hazelwood is closed, the air in the Latrobe Valley will immediately be cleaner. Well maybe not quite that clean, as there’s still 3 coal fired power stations operating in the Valley, but the air will definitely be cleanER. Regional communities have been shafted by the Federal Government and fossil fuel companies. 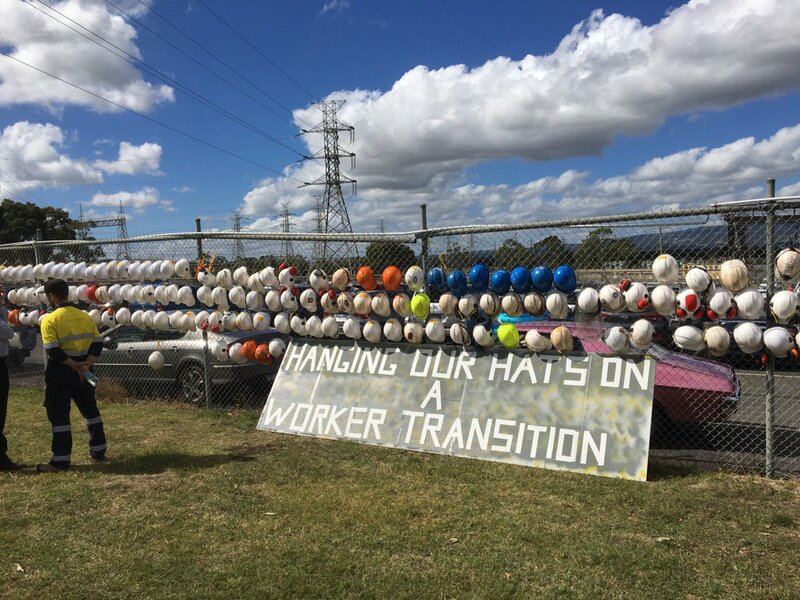 Despite Hazelwood being an ancient relic, and the coal industry on the rapid decline, workers at Hazelwood were given hardly any notice of when they’d no longer have a job. Australia needs the Federal Government to develop a national transition plan to clean up our energy supply and provide certainty for coal communities. When the government doesn’t have a plan, communities get left in the lurch. Hazelwood will be the 9th coal fired power station to close in Australia in the last 5 years. Anyone else seeing a trend there…? It’s gonna take years to rehabilitate the mine and dismantle the power station. Roughly 130 workers will be employed during the mine rehabilitation. (No, not the kind of rehabilitation you’re thinking of.) Rehabilitation of a mine means restoring the environment to as close to it’s natural state as possible. At the moment the only idea is to turn the mine into a lake…. This raises a few questions, Lake Hazelwood would be 1.2 times the size of Sydney Harbour. Where are you gonna get that water from? Won’t #climatechange mean that there might not be heaps of that around? Also who wants to swim in filthy coal water?? It reminds me of the part in the Castle where Dale dug a hole, and it's filling with water. The future of the Latrobe Valley doesn’t depend on coal. Young people in the Latrobe Valley are full of optimism, creativity and resilience. They’re excited about a future beyond coal. They’re helping create new opportunities in their community, setting up solar hot water cooperatives, repowering their schools with renewable energy and being just generally rad teenagers.